Distributed applications take full advantage of living in the cloud to run globally, avoid bottlenecks, and always be available for users worldwide. This not only requires the right infrastructure to be deployed in, but also support for the decoupled architecture an application with these characteristics versus the traditional monolithic approach. This is why most cloud native applications are using a microservices architecture that helps achieve this at global scale. The benefits of using a microservices architecture are maximized when those applications are built in the cloud, with a wide range of managed services that will make it easier to materialize the microservices promise. With those services managing infrastructure and scaling for you, and improving the way you can do critical processes like deployment or monitoring those solutions, you can maximize the amount of value delivered per cycle. There are different patterns you might want to explore and each of them fits a specific scenario. Today we’re focusing on how building serverless microservices is a great fit for event-driven scenarios, and how you can use the Azure Serverless platform. Scaling compute resources: With the automated and flexible scaling based on actual demand that’s provided by a serverless platform, you don’t need to worry about how the scaling happens or how to handle it on the code of your application. Operations dependency: When deploying a microservices-based solution, there is usually a strong dependency on the operations teams for allocating infrastructure resources for deployment and execution, both initially and with each incremental change. Taking a serverless approach by using fully managed services removes that necessity, since all the underlying infrastructure is managed for you by the platform. Costs for hosting: With a traditional deployment, the cost is determined by how much you have to pay for each hosting node, and usually implies an over allocation of resources, resulting in increased hosting expenditure. With an event-driven approach, using services with consumption-based pricing models means the price is determined by the number of requests or operations, and the costs for hosting are better adjusted to the real usage of the solution (and are usually lower). A centralized, unified way of communicating services via events using a pub-sub model, fully managed with Azure Event Grid. 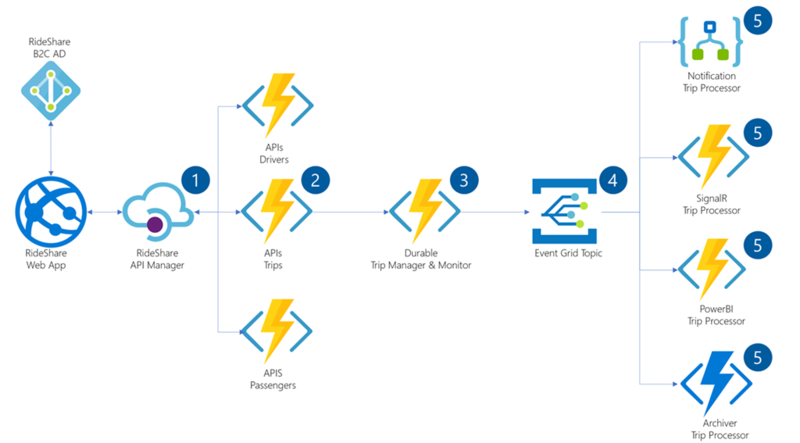 An integrated programming model based on triggers to automatically respond to those events and bindings to connect and integrate different services seamlessly, such as the experience offered by Azure Functions and Logic Apps for event-driven compute. API Gateway: Using API Management to expose the endpoints of the backend services, so the client application can consume them securely. This also helps with decoupling the client side from the backend, since you can easily manage changes on where the services are actually hosted from the gateway without affecting the client application. Entry points: The public facing APIs that the client application will be using, powered by Azure Functions responding to HTTP requests. Workflow orchestrator: Middle-tier service to interconnect the public facing APIs with the actual backend services that are tied to the data stores and other critical components, orchestrating the work of these services based on actions on the client side. Async queue: Messaging service to handle services intercommunication and pass along information and data between the different services, represented by Azure Event Grid. By using an event-driven approach, we’re also favoring services decoupling, since the information exchange will have a fire-and-forget approach, with services pushing events and handlers subscribed to those events and handlers subscribing to those events for processing. Backend services: The services that are directly operating with the data layer and other components of the solution, isolated from the rest and easily replaceable if needed (e.g. changing the type of database used to store data) without affecting the rest of the application and interactions. 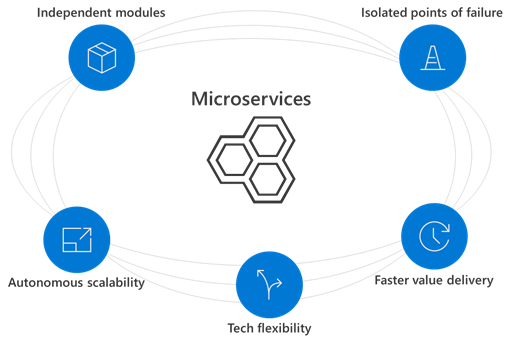 - Register for this webinar to learn how to develop microservices-based applications with a serverless architecture using fully managed Azure services. - Browse the Relecloud Rideshare sample architecture to get step-by-step guidance on how to build the sample application and detailed information of the solution design. - Sign up for an Azure free account if you don’t have one already, and start building serverless applications today.